Sen. Reid: Looks Like We're Headed Over The 'Fiscal Cliff' : The Two-Way President Obama has returned to Washington. The Senate is back in session. House Republicans have said they're willing to talk. But with just a few days to go, both sides are saying the other will be at fault if automatic tax hikes and spending cuts aren't averted. Senate Majority Leader Harry Reid, D-Nev., addresses reporters about ongoing discussions about the so-called fiscal cliff on Dec. 18. Even as Air Force One was about to land in suburban Maryland this morning — bringing President Obama back from his vacation in Hawaii to resume negotiations aimed at avoiding the so-called fiscal cliff of automatic tax increases and spending cuts — Senate Majority Leader Harry Reid was on the floor of the Senate warning that a dive off that cliff seems inevitable. "It looks like that's where we're headed," the Nevada Democrat declared. 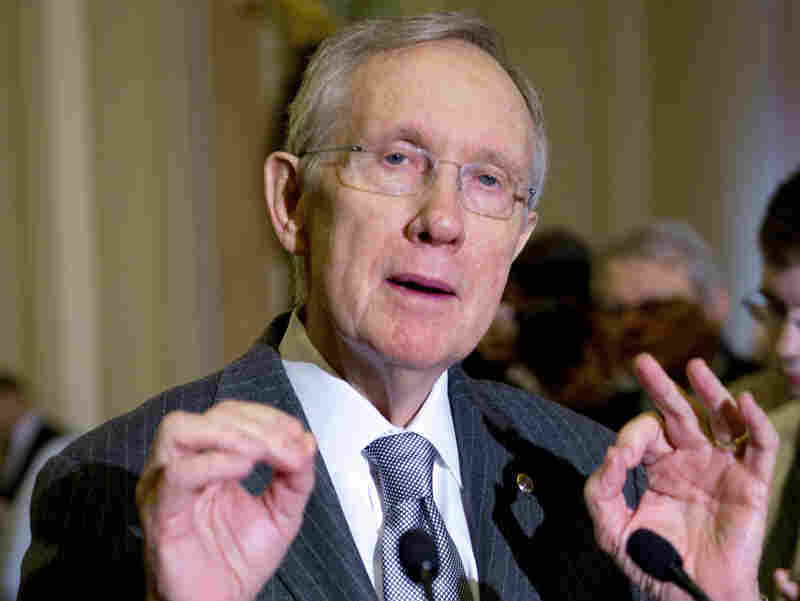 Not surprisingly, Reid laid the blame for any such plunge at the feet of Republicans. House Speaker John Boehner and Senate Minority Leader Mitch McConnell, Reid said, have been "radio silent." Those GOP leaders, also not surprisingly, disagree. Wednesday, Boehner's office released a statement saying that "the House has acted on two bills which collectively would avert the entire fiscal cliff if enacted. Those bills await action by the Senate." In theory, the fiscal cliff arrives late Monday as 2012 becomes 2013. As we said Wednesday, though, there are ways that the president and Congressional leaders could "kick the can" again and come up with some sort of partial solution. The New York Times' Jonathan Weisman tweets that "Obama will meet with Boehner, Pelosi, Reid and McConnell tomorrow. Maybe there's life, maybe just for show." Meanwhile, House Republicans have been told by their leadership that they're to plan on being back in session Sunday evening, The Guardian writes.